Meta: Christmas traditions in France. For those in love with all things French, because let’s just face it croissants have enraptured just about everyone with taste buds, then you will be pleased to know that the French have managed to put their own spin on the festive season as well. Therefore, we decided to dig up some of the most novel and distinctly French traditions there are surrounding Christmas, for example, did you know that there is no Boxing Day in France? Now the French have variable days on which they open Christmas gifts, some families choose to hand out the presents on the sixth of December, however this is more prominent in the northern provinces of France than in the Southern regions. Others do the unwrapping on December the 24th, which is probably an ingenious move on the part of parents who want to sleep in on Christmas morning. However, for those who are truly hoping to draw out the Christmas spirit or who simply want to catch up on the post New Year sales, they will hand out their gifts on January the 6th, which is otherwise known as the Feast of Kings. The French take letters to Santa Clause really seriously; they’ve had a law since 1962, which clearly outlines that any child who writes a letter to Santa must receive a postcard to acknowledge their letters to the North Pole. Now the French needing to put their own stamp on the age old nativity scene, decided to take the traditional marker of Christmas and make it even more ornate, the French version features all of the staple characters and a couple others such as a grocer, sellers of daily goods and even officials – these figurines are known as Santons. Now there is a rather grim character that applies within the French version of Christmas to ensure that children behave throughout the holidays, the French version of the Grinch is known rather fondly as Father Slapper and legend has it that he rides with Santa Clause and slaps the children who were too naughty to receive presents. Whereas most children tend to hang stockings by the fireplace to be filled with goodies, the French place shoes in front of the fire in order to have them stuffed with anything from presents to little chocolates and other edible treats. 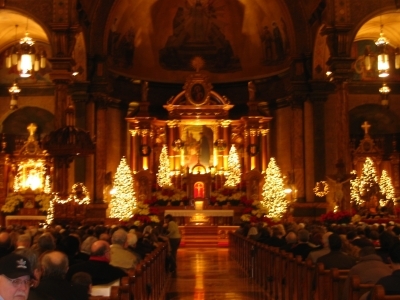 Throughout France the tradition of attending mass on midnight on Christmas Eve lives on, the wide variety of churches throughout the country are aglow with candlelight and packed with the sound of carols and hymns throughout the night on Christmas Eve. 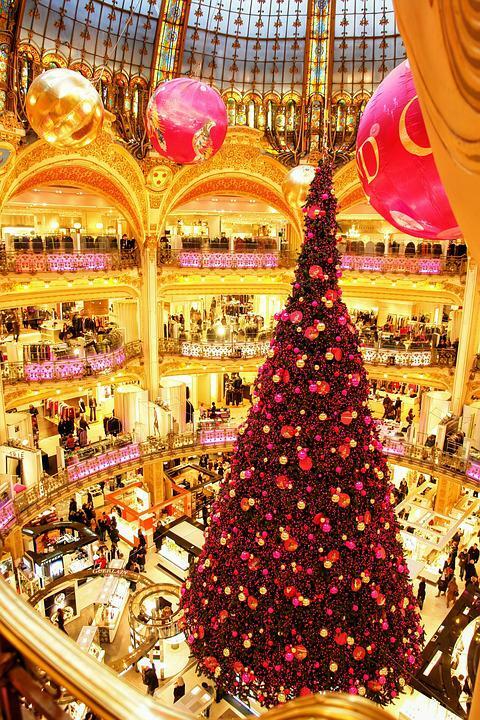 After the mass or sometime in the evening on Christmas Eve, the families in France will indulge in an enormous Christmas feast, typical menu items include turkeys stuffed with chestnuts, goose, oysters, foie gras and of course, champagne because what’s more French than luxury? One final feast that the French observe is on the 12th day of Christmas known as the Feast of Epiphany where the cake of Kings is eaten, whoever finds the hidden figurine is crowned king for the day and gets to choose their partner.